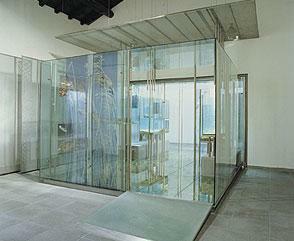 Laminated safety and security glass, SGG STADIP or SGG STADIP PROTECT, comprises two or more sheets of glass bonded together with one or more interlayers of polyvinyl butyral (PVB) film. 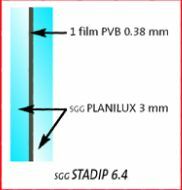 SGGSTADIP glass incorporates a single PVB sheet with a nominal thickness of 0.38 mm, distinguishing it from SGG STADIP PROTECT glass which has a minimum thickness of 0.76 mm. Protection in buildings is increasingly required to comply with current regulations, for insurance purposes or simply to fulfil a genuine need, especially against the risk of injury, vandalism and burglary. 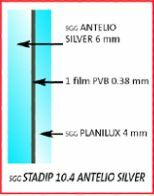 In homes, SGG STADIP and SGG STADIP PROTECT glasses can offer appropriate safety and security solutions to meet the combined criterion of protection, aesthetics and performance.